High school tennis in Florida is about to take flight again for the 2018-2019 school year. There are so many great stories from last year. Alana Wolfberg winning her third straight singles championship. The girls’ team from Marjory Stoneman Douglas finishing in the Top 4. Many of our USTA top-ranked juniors competing for their schools — players like Logan Zapp from Fleming Island, Emma Shelton from Gainesville Bucholz, Samantha Alicea from Miami Palmetto, Brandon and Brian Pham from Bartram Trail, Juan Bianchi from Olympia, Natalie Block from American Heritage Plantation, Matthew Fung, Dillon Blake and Randy Wilson from Miami Palmetto, and so many more. When so many players of this caliber over the years have chosen not to play for their high schools for whatever reason, it’s refreshing to see that changing. While some may not see value in the high school season, whether it’s personal coaches not wanting their players to “waste” time with high school tennis, players concentrating on high-level USTA tournaments to get their ranking up for college consideration, AP course requirements and so on, last year showed that competing for your school with your teammates is fun, rewarding and can be competitively challenging. Florida juniors who’ve played both high-level USTA tournaments and high school tennis have seen college opportunities come their way in recent years. David Gorshein from Lake Mary High and Samantha DiMaio from Trinity Prep went on to West Point, Mira Gladstone who played for Spruce Creek went to Davidson, previously-mentioned players Alana Wolfberg and Emma Shelton have committed to Oklahoma State and South Carolina respectively, and there are certainly many more to come. This season I’m sure will be no different as teams march through their regular seasons, move into district and regional play, culminating with the state championships at the end of April to be held again in Central Florida. What teams will advance? What players will rise to the top? Will records and first-time achievements be set? These questions and more are sure to be answered but one question already has. 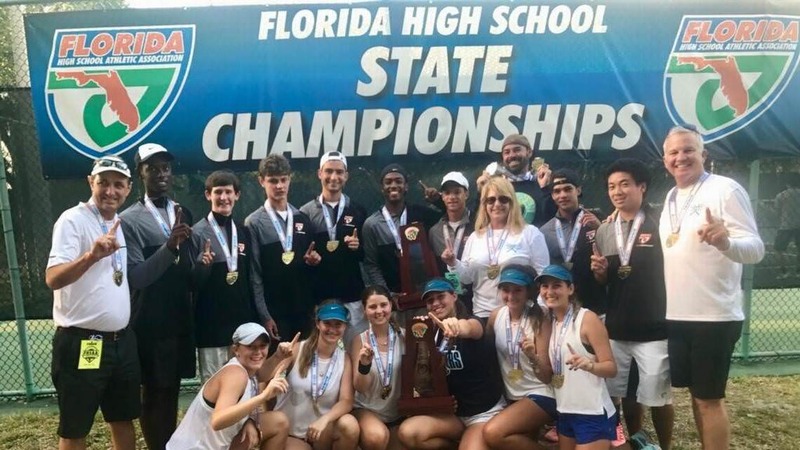 The skill level in high school tennis in Florida is getting better and better every year and players are seeing value in being a FHSAA state champion! To those of you representing your schools and competing with your teammates, good luck and enjoy your season!